The Statistician General, Mr Alex Shimuafeni, had the unpleasant task on Thursday to inform the nation that Gross Domestic Product (GDP) has again contracted for the third calendar quarter of 2017, making it the third consecutive quarter of negative growth. The economy is now beyond any doubt in a prolonged recession. 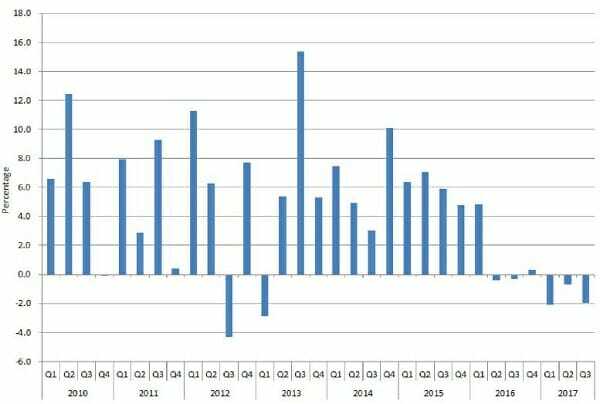 The construction sector was again the biggest contributor to the decline in GDP, contracting by another massive 36.9% compared to the third quarter of 2016, when it has already fallen off a cliff compared to 2015. Other third quarter disappointers are Wholesale and Retail (-4.4%), Water and Electricity (-5.5%), and Fishing (-1.3%). Mr Shimuafeni said GDP decreased by 1.9% compared to the third quarter of 2016, which had already then declined by 0.3% compared to 2015. “Public Administration and Defence, and Education also recorded declines in real value added of 4% and 0.4%, according to the Statistician General. Where sectors managed to post positive growth, the rates were generally modest. Agriculture and Forestry was up 5.3%, Hotels and Restaurants a measly 0.1%, and Transport and Communication 1.3%. In the third quarter of 2016 all three these sectors posted robust growth compared to 2015. As expected the Namibia Statistics Agency revised the second quarter GDP growth rate substantially upward, from a -1.7% to only -0.7%. This constitutes a 59% adjustment. On 22 September this year a similar adjustment to first quarter GDP saw the preliminary figure adjusted from -2.7% to -1.7%. There is zero indication in the latest GDP report how this value mysteriously has been re-readjusted to -2%, as is evident in the GDP graph.